Just as it was launching its new Miller Lite Vortex bottle, MillerCoors reached out to Axia Public Relations for help in targeting a specific audience in the Southeast for its unique consumer packaged good product launch, the Vortex bottle. MillerCoors sought Axia to raise public awareness of the Vortex bottle and ultimately increase its summer sales. When Miller Lite introduced the new Vortex bottle, which had special grooves inside the bottleneck to make the “great pilsner taste flow right out,” MillerCoors hired Axia as part of its six-market “Vortex Day,” a Southeast product-launch and test-market campaign. MillerCoors challenged Axia to increase consumer awareness of the Vortex. Axia aimed to localize the Vortex campaign among select venues with high Miller Lite sales and created publicity using local media, a celebrity and a charity, partnering with the Audubon Society to aid cleanup efforts during the highly publicized Gulf of Mexico oil spill. Overall, the Vortex promotional team included Miller Lite girls, Miller Lite executives, a Miller Lite-wrapped Cadillac Escalade, a celebrity and a charitable angle. 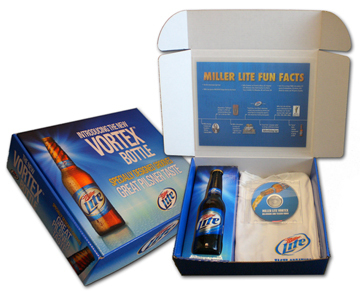 In each market, MillerCoors promoted the Vortex, encouraging consumers to drink Miller Lite and rewarding consumers already drinking from a Vortex bottle on the day of the event. Through its set of contacts, Axia presented options for celebrities who could work with the promotional team. Axia also used its vast database to ensure that the new Vortex product, promotion, celebrity and charity angle each earned exhaustive media coverage. Axia created Vortex social media channels, including Twitter, Facebook and LinkedIn accounts, updating the sites regularly with details about tour stops, media appearances, fan participation and photos. On the day of the event, Axia invited a local micro-celebrity blogger to join the experience while updating online followers and encouraging them to come and join the fun. Axia promoted the Vortex bottle at Miller Lite’s top-selling retail stores and restaurant venues in each target metropolitan market. In advance of the events, Axia distributed a news release and pitches to target media outlets, including print, online, radio and television. The public relations agency anticipated that news coverage on local morning shows and during the day would increase the awareness of the new bottle as well as the number of consumers attending Miller Lite’s evening events. The PR team connected with key Miller Lite accounts and secured multiple news interviews on-location at the retail stores and on restaurant site visits. Outreach to the media earned successful coverage in each market, including interviews on every local TV station, and newspaper articles that presented business and consumer angles on Miller Lite’s new product and summer beer sales. In each market, MillerCoors donated more than $2,000 to the Audubon Society for oil spill cleanup efforts, contributing $1 for every autograph signed by the celebrity and $2 for every person caught drinking from a Vortex bottle. Miller Lite also held a free-beer-for-a-year giveaway at each promotional stop. Axia returned MillerCoor’s investment in public relations services more than 10 times with positive earned news and social media coverage for Miller Lite during the campaign, based on independent media-monitoring and measurement services. The client proclaimed the campaign a huge success. To learn how we can help your food and beverage company achieve similar results, contact us today at 888-PR-FIRM-8 (888-773-4768).